Today, the US Department of Energy took a bold step forward in wastes to biopower and gaseous fuels for medium and heavy-duty vehicles. It’s part of a major $51 million funding package for advanced vehicle technologies that also includes work on energy-efficient engines and fast-fueling for hydrogen fuels. In the topic most relevant to the advanced bioeconomy today, the Energy Department is focusing on “Gaseous Fuels Research and Technology Integration for Medium- and Heavy-duty Vehicles”. Specifically, high density gas storage and transport, advanced waste to energy technologies, and technology integration that focus on lowering the cost of and overcoming technical barriers to the use of medium- and heavy-duty natural gas and hydrogen fueled vehicles. Awards are anticipated to be $1.5-3 million for a total amount of $5 million. Concept papers for this funding opportunity are due March 29, and full applications will be due May 15. Gaseous fuels have been the little-known bright star of cellulosic technologies — more than 98% of all cellulosic fuels used in the United States come in the form of renewable natural gas, usually known as CNG with the C standing for “compression”. There’s been a surge of project interest in recent months — and companies like Sevena, Agri-Energy, Iogen, Trillium and British Gas are actively pursuing projects and/or project affiliations among the companies that will be presenting at ABLC 2019. Plus, the Coalition for Renewable Natural Gas will join the main trade associations on ABLC’s opening main stage day in the annual look at policy. Meanwhile, we are reporting on a lot of project activity. Verbio is converting the former DuPont cellulosic facility in Iowa to cellulosic gaseous production, and VERBIO is also pursuing a project in Kanass, and more on that here. In recent news, we reported yesterday that Clean Energy Fuels will offer Zero-Carbon Redeem renewable natural gas at all of its fueling stations by 2025. More on that here. And we reported last month that Calgren Dairy Fuels is now injecting bio-RNG into Southern California Gas pipelines. More on that here. Sources can include dairies, food waste, cattle ranches and more. 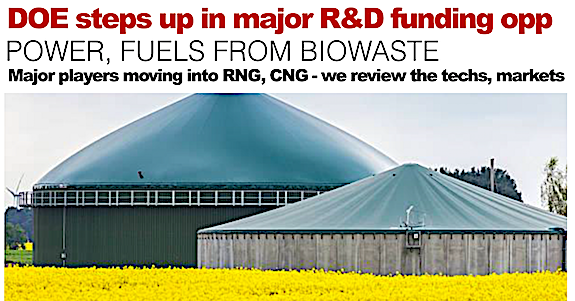 Last month, we reported on a study that shows biogas from food industry waste can be profitable. Overall, the U.S. Department of Energy announced up to $51.5 million for new and innovative research of technologies for trucks, off-road vehicles, and the fuels that power them. Funded through the U.S. Department of Energy’s (DOE’s) Office of Energy Efficiency and Renewable Energy (EERE), the FOA addresses priorities in gaseous fuels research, including natural gas, biopower, and hydrogen; heavy-duty freight electrification; hydrogen infrastructure and fuel cell technologies for heavy-duty applications; and energy efficient off-road vehicles. For more information and application requirements, you can visit the EERE Exchange website or Grants.gov.